They say the pen is mightier than the sword. Well, what if the pen is also mightier than your average online dating service? The latest film from the Little Miss Sunshine (2006) directors (Jonathan Dayton and Valerie Faris) has a storyline seemingly pulled from a script that even Andrew McCarthy would have rejected during his eighties heyday. Calvin Weir-Fields (Paul Dano) is an American writer struggling to come up with his next book when the inspiration for his new character comes to fruition. Not just in his overly active imagination, but in the living breathing world as well. This dream girl of his literal fantasies is called, Ruby Sparks. Paul Dano has proved to audiences he’s here to stay. In There will be Blood (2007) his conniving Eli Sunday stood up against Daniel Day Lewis’s Oscar winning oil tycoon Daniel Plainview. He has also appeared in Hollywood blockbusters like the upcoming Looper (2012), Cowboys and Aliens (2011) and HBO’s The Sopranos for television. Ruby seems an odd choice for an actor who is currently doing a good job at climbing the Hollywood ladder. There is no meat on the bone to this flick, neither is it broad enough in style to satisfy much more than your average high school hipster. The jokes are funny and the actors bring them more life than what they would have on paper. Annette Bening, Antonio Banderas and Elliott Gould add some needed color as Calvin’s hippy mother, boyfriend and therapist. The problem with Ruby is that it never goes beyond its simple and quite juvenile pretense. The film has predictable turns and a very obvious Hollywood ending not unlike the cringe worthy (500) Days of Summer (2009). The film does have a nice clean production style with much of film being set in Calvin’s post-modern white home. This leaves the focus on the characters and this works nicely. When the camera does venture outside, it's always light and sunny. This is the overall tone for this film. While Calvin’s obsession with Ruby has some darker moments, they don’t stay for long and are usually written around comedic moments. Newcomer Zoe Kazan, who is also the writer of the piece, plays Ruby with vibrancy and charm. Acting very much like the kind of girl that Calvin would dream up and the two actors work very well together. 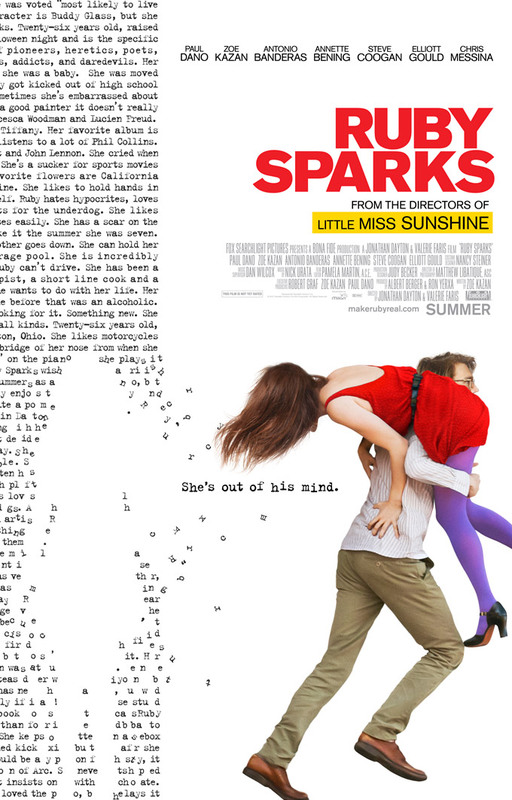 Ruby Sparks seems like a very odd follow-up to the director’s success all the way back in 2006 with Little Miss Sunshine. Sunshine was critically acclaimed across the globe and very left of center to typical Hollywood fare. Despite its ensemble cast (which is a great award winner in the city of celluloid), it was a story of a fractured family with real problems. Ruby is a fluffy fun romantic comedy aimed at the younger audiences. While it works on a simple level, its twee concept and lack of bite may keep audiences at bay. It is a cute romantic comedy with adequate acting and sufficient laughs. Those who haven’t completed high school just found their next date movie. The older viewers out there are just going to have to wait for Rachael McAdams to lose her memory again to get their next dose of romantic thrills.